You are currently browsing the tag archive for the ‘camp darfur’ tag. My second destination on the Better World Island is if anything even more powerful and affecting than the first. 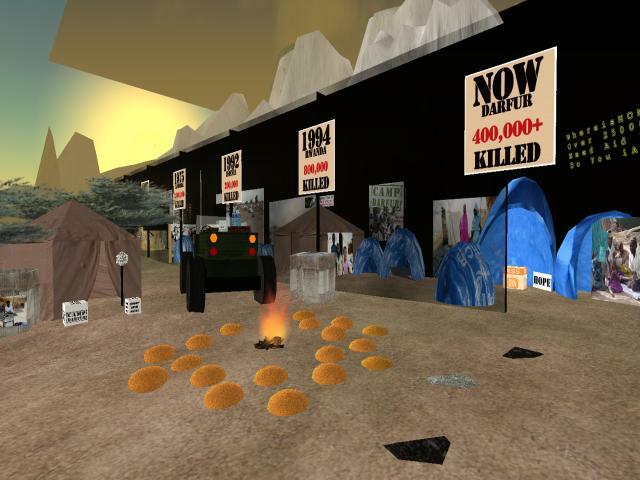 This is Camp Darfur, based around the terrible events in the Sudan. This is going to be a shorter blog post, because I am reduced to silence. Words and pictures can’t adequately convey the impact of this particular exhibition (and “exhibition” really seems the wrong word), I can only encourage you to visit it yourself. As with the Baghdad Streets area, it includes some practical ideas, in this case mainly by way of links to websites where you can sign petitions or join groups to support the work of others. This will take you to the hub. You can explore the island from there, or use the teleports.